Last fall we saw some PS5 / PSVR2 Concept Designs, and according to reports PlayStation 5 backwards compatibility with PS4, PS3, PS2 and PSX could be in development as Sony patents allowing devices to determine whether an application is a legacy one or not were recently uncovered on a Japanese Blog. Here's to hoping Sony unveils official details on their next-generation console sometime this year, and until then check out the PlayStation 5 / PS5 trailer concept video from ConceptsiPhone's YouTube Channel below. According to the PS5 concept design video's description, this concept idea is by Iskander Utebayev, the video from @Ran Avni with VFX by Alex Richman. Build-in display makes it easier to operate the console, and could assist you with the PS settings without a game interaction. New option added, that attaches headphones to the controller which transmits a game sound exclusively into a gamers ears. New PlayStation also includes upgraded system that allows users to enjoy the game on a new level with a 4K definition. Controllers lights are not only a fancy addition to its design. It also helps users to enjoy the game with an according light theme. (Red and Blue, if a user is getting chased by the police, or alert of a danger that player is about to engage). Deepak10151, MadPotato24 and GhostMaree like this. That black image with the green discs flying out towards the end of the video: if it’s a standard BD disc it’s 120mm it looks like the drive takes up roughly 1/4 of the length of the console so the console would be at least 480mm + edging panels and bezel girth... that’s nearly half a meter... PS4 phat is 11” (270mm) x 12” (300mm)... pro is 13” (330mm). Jesus that thing would be a tomb stone! interesting but this is just one person's concept idea. They just cut the top half off of a 1st gen ps4 and elongated it by 50%. 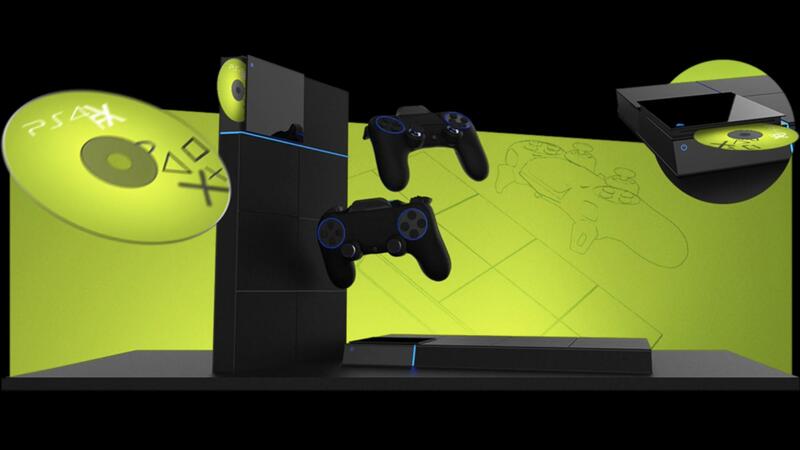 PS5 won't look anything like that. Microsoft and sony always make a BIG distinctive change to their consoles from one gen to the next and they've been doing it for 20yrs. Look at ps2 compared to PS1, the ps3 compared to ps2, and ps4 to ps3, BIG major differences in each, why would we think they would cut the top half of a 1st gen and make it longer... or something similar? I think its going to mimic more of their weird (but good looking) wedge shaped bluray players or something that is NOT your usual Asymmetrical shape. I applaud the effort to make the video, but its way off. you'll see. I like the look but really not much change between ps4 and 5 maybe length here and there and add different fan and ram as there concept of cpu always looks like risc processors and always embedded system concept. Either way I like the looks but we will see on release. If sony had hopes to make there platform across maybe they should have planned this out better to keep b/c or they are gonna struggle. But problems may arise when they realize there emu is not compadable with ps3 so as far as I can see streaming is there only option again. Picture shows PS4FX not ps5. My gosh. Other concept.. All concepts for PS3/PS4 failed. None matched and not even closer PS3/PS4 at all. It is not going to be matched or closer to PS5 at all this time. Silly concept arts! It's now Apr 21, 2019 at 12:20 PM.